Q. Yi and S. Singh, "Usage based topology for DCNs", IEEE ICC 2015, London, UK, June 7-12, 2015. Q. Yi and S. Singh, "Achieving Energy-Proportionality in Fat-Tree DCNs", IEEE GLOBECOM 2014, Austin, TX, Dec. 8-12, 2014. F. Moshir and S. Singh,"Pulsed Terahertz Time-Domain Communication", IEEE GLOBECOM 2014, Austin, TX, Dec. 8-12, 2014. 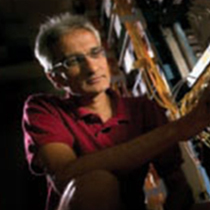 F. Moshir and S. Singh, "Wireless Barcodes for Tagging Infrastructure", ACM MOBICOM 2014, Maui, HI, Sept 7-10, 2014. F. Moshir and S. Singh, "Ultrafast Pulsed THz Communication", IEEE PIMRC 2014, Washington D.C., Sept. 2-5, 2014. Q. Yi and S. Singh, "Minimizing Energy Consumption of Fat-Tree Data Center Networks", Greenmetrics 2014 (in conjunction with ACM SIGMETRICS 2014), Austin, TX, June 16, 2014. Q. Yi and S. Singh,"Agile Traffic Merging for DCNs", 3rd International Workshop on Energy-Efficient Data Centers (Co-located with ACM E-Energy 2014), Cambridge, U.K., June 10, 2014. Ansuya Negi and Suresh Singh, SIR and outage countours in 2-hop relaying cellular networks, IEEE VTC (Spring), May 17 - 19, 2004, Milan, Italy. Kevin Brown and Suresh Singh, Network architecture and communication protocols for mobile computing, Intl. Journal Wireless Information Networks, 1997. K. Ravishanker and Suresh Singh, Central limit theorem for time to broadcast on [0, L], Probability in the Applied and Informational Sciences, Vol. 9, 1995, pp. 201 - 209. Suresh Singh and K. Ravishanker, Asymptotically optimal gossiping on [0, L], Discrete Applied Math, Vol. 61, 1995, pp. 61 - 85. Juan Duan and Suresh Singh, Efficient utilization of multiple channels between two ATM switches, IEEE ICC June 18 - 20, 1995. Soman Sadhana and Suresh Singh, An experimental study of video conferencing over the Internet, IEEE GLOBECOM, Nov. 28 - Dec 2, 1994, pp. 720 - 724. Suresh Singh and M. A. Sridhar, Gossiping in radio networks, 6th Intl. Conference on Parallel and Distributed Computing and Systems, Oct. 3 - 5 (1994), pp. 456 - 459. K. Ravishanker and Suresh Singh, Broadcasting on [0,L], Discrete Applied Math, Vol. 53(1-3), 1994, pp. 299 - 320. Suresh Singh, Expected connectivity and leader election in unreliable networks, Information Processing Letters, No. 42, 1992, pp. 283 - 285. Suresh Singh and Jim Kurose, Electing leaders based on performance: the delay model, ICDCS, May 1991, pp. 464 - 471. Jim Kurose, Suresh Singh and Renu Chipalkatti, A study of quasi-dynamic load sharing in soft real-time distributed computing systems, IEEE Real-time systems symposium, Dec. 1986, pp. 201 - 208. Jim Kurose and Suresh Singh, A distributed algorithm for optimum static load balancing in distributed computer systems, IEEE INFOCOM;86, pp. 458 - 467.